00:48 | Thais from across the country continue to visit the Grand Palace to pay their respects to the late King Bhumibol Adulyadej. 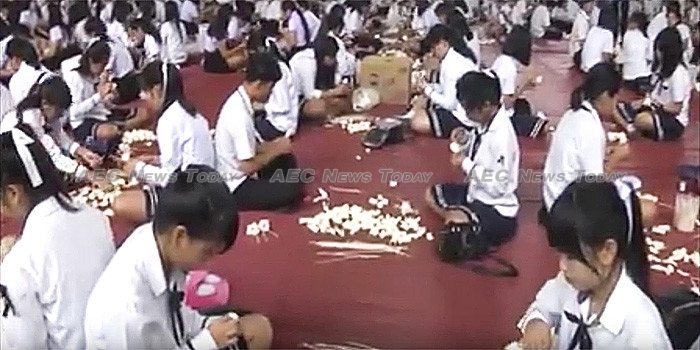 Meanwhile workshops continue to be organised to make sandalwood flowers in preparation for the royal cremation on October 26. 02:58 | Deputy prime minister, General Prawit Wongsuwan, said that the police commission has approved the promotion of 183 police officers, including a new chief for the Metropolitan Police Bureau (MPB). The names of the appointed officers will be released within the next three days. National police chief, Police General Chakthip Chaijinda said that the candidate for the head of the Immigration Bureau was changed due to internal problems. 04:10 | Deputy prime minister, Dr Wissanu Krea-ngam, has attended the first meeting of the National Reform Committee (NRC) responsible for 11 areas of reform. All committees are required to submit their drafts by September 15th to be reviewed by the NRC, with details of the reform plans expected to be announced before April, 2018. 05:12| The Hajj affairs office of Thailand (HAOT) has met with Hajj service providers to review accommodation plans for Thai pilgrims in Saudi Arabia. A medical unit has also been dispatched to conduct health checkups of Thai pilgrims. 08:26 | The Ministry of Commerce (MoC) plans to increase the number of Pracharat Blue Flag shops to 8,000 by October 2017 and increase the range of discounted goods available for low-income earners to at least 100 items from the current range of 48 products. 09:50 | Eight specialised financial institutions are holding the first of a series of Pracharat market’s in Bangkok to teach low-income earners about capacity building and entrepreneurship, as well as to provide local entrepreneurs with a venue to market their products. The event will run until December 2017 with the institutions taking it turns to host the market. 11:14 | The Bank of Thailand (BoT) is working with American Express, JCB International, Mastercard, Unionpay, and Visa to develop a central QR code system to develop a cashless e-payment system for use throughout Thailand. 12:27 | The Electricity Generating Authority of Thailand (Egat) said that it will need at least three years to finish the feasibility study and the Environmental Health Impact Report (EHIR) for the Thepa coal power plant in Songkhla Province, which is a part of EGAT’s 2015-2036 plan to ensure energy security in the southern region. 14:07 | Prime Minister General Prayut Chan-o-cha has expressed his satisfaction over the performance of Thai athletes in the 2017 SEA Games. Thailand came in second with 72 gold, 86 silver, and 88 bronze medals, while host nation Malaysia took the top position, with Vietnam and Singapore ranked third and fourth respectively. 15:16 | The Ministry of Foreign Affairs (MoF) has held a series of seminars and competitions to commemorate the 60th anniversary of Thailand-Malaysia diplomatic relations. 17:31 | The Ministry of Labour (MoL) has announced that Noppakhun Khunrat is the winner of a design contest it held in preparation for the 12th Worldskills Asean Bangkok 2018 Mascot Design Contest. In addition to Bt80,000 (about US$2,405) in prize money, Mr Khunrat’s design will be used during the 12th Worldskills Asean Bangkok 2018 Mascot Design Contest, which Thailand will host in 2018.